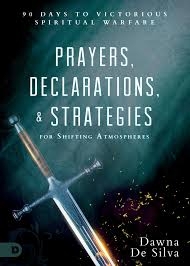 Prayers declarations and strategies for shifting atmospheres | Karmal Books online Christian books and media store. Every day, whether we realize it or not, we enter a spiritual battlefield. There are forces around us that need to be discerned and transformed. These forces create atmospheres. Too many people either tolerate these negative atmospheres or run away from them in fear. As a child of God, filled with the Spirit, you are called to shift these atmospheres by using your Kingdom authority! Based on Dawna De Silva's powerful teaching on shifting spiritual atmospheres, these 90 daily readings will equip you, day by day, for transforming the different environments you enter. See into the unseen. Get more in tune with the invisible realm around you. Get on the offensive. Discern the devil's tactics and live a step ahead of his strategies. Claim your victory.Use the weapons of warfare that give you an upper hand in spiritual conflict. Release the Holy Spirit. Learn how to release God's Presence to change any atmosphere you experience by using your Kingdom authority. You don't have to deal with demonic or tormenting atmospheres. You were meant to carry the power that defeats darkness. Learn how to exercise your spiritual authority on a daily basis and shift spiritual atmospheres through the Presence of God!